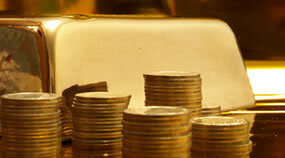 Precious metals started July and the second half of 2013 with broad gains after tumbling in the second quarter. And in a rare daily event, U.S. Mint sales increases were logged Monday for each of the bureau’s bullion coins. Returning to metals, gold for August delivery rallied $32, or 2.6%, to finish at $1,255.70 an ounce on the Comex in New York. Gold traded from a low of $1,224.10 to a high of $1,261.70. Higher demand for physical gold supported gains, opined analysts. "Physical demand in Asia continues to be strong," Carlos Perez-Santalla, a New York-based broker at Marex North America LLC, said in a telephone interview. "The focus on the Fed stimulus and when the tapering may begin has begun to wane." Silver for September delivery gained 10.8 cents, or 0.6%, to $19.58 an ounce, ranging from $19.36 to $20.08. October platinum advanced $42.60, or 3.2%, to $1,382.50 an ounce, trading between $1,335 and $1,387.90. September palladium leapt $26, or 3.9%, to $686.70 an ounce, ranging from $658.25 to $689.45. Friday closed out the second quarter with steep losses across precious metals that totaled 23.3% for gold, 31.3% for silver, 14.9% for platinum and 14% for palladium. Second quarterly declines for London bullion fixings were 25.4% for gold, 34.1% for silver, 16.4% for platinum and 16.5% for palladium. Gold coins increased by 20,000, which is just 2,000 ounces shy of matching last week’s solid total. Silver coins climbed by 857,500 ounces, which is only 39,000 ounces away from last week’s tally. The following are daily, July and year-to-date bullion coin totals as published by the United States Mint. Figures above are in the number of coins sold, not in ounces. All time lows, everyone should stock up on Gold and the other precious metals now. It’ll never be this way again: a long, steady gait to a clear bottom, with a quick snap of a turnaround. Very clearly a buyer’s market for bullion. And also time for the proofs to be purchased as well. The paper bullion owners have manipulated precious metals foe quite some time now. Its true this is an exellent time to purchase the metals,but the paper bullion owners should be compelled to prove actual phyical metals. They have have kept the price of silver(for example) under valued since it hit almost $50. an ounce back around 2010. Many bullion dealers will not sell their pieces because they paid alot more for it in the past. Unai-gold might go lower, all it does is present another buying opportunity for long term holders of physical gold and silver. L – Gold at all time lows?? Pretty much, the only way gold will go much lower is if we get into a full blown depression. Get it while it’s this low. Prices go up and mint sales rise. Funny how people won’t buy when the prices are low, only when they go up. CM- Gold will go lower if the economy tanks?? ?